Bishop Nicholas DiMarzio has named Monsignor Jamie Gigantiello Director of the Office of Parish Giving and Vicar for Development, while remaining pastor of Mary Queen of Heaven in Old Mill Basin. This Parish Giving Office under Monsignor Gigantiello’s direction oversees all parish giving and increased offering programs. 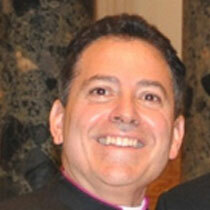 He also serves as Executive Director for the Diocese of Brooklyn’s Annual Catholic Appeal. As Vicar for Development, Monsignor oversees the Catholic Foundation for Brooklyn and Queens and Futures In Education in addition to the Parish Giving Office. Prior to studying for the priesthood, Monsignor Gigantiello received a Business Degree from Baruch College and graduated from The Culinary Institute of America. For ten years, he worked in New York City’s hotel industry in various managerial positions before entering Immaculate Conception Seminary in Huntington. After his Ordination in 1995, Monsignor Gigantiello served as parochial vicar at St. Patrick’s Parish, Bay Ridge. Five years later, he was assigned to Mary Queen of Heaven Parish. After serving as parochial vicar for two years, he was installed as pastor in April 2002. In addition to his parish responsibilities, Monsignor Gigantiello remains active in numerous diocesan, community and city-wide organizations and events. He continues to serve on the Coordinating Committee for the Bishop’s Annual Christmas Luncheon and is the clergy moderator for the C.Y.O. Classic Golf Outing held annually at the North Hills Country Club. He has served on a variety of civic and not-for-profit boards, including the Board of Directors of MERCY FIRST. Following September 11th, the New York City Police Department made him an Honorary Chaplain in recognition of his work at Ground Zero and he continues to receive numerous awards for his outstanding community leadership. Monsignor ministers as Chaplain to the NYC Taxi and Limousine Commission, the NYC Transit & Corrections Officers and the Columbian Association of New York. He also serves as Spiritual Moderator for the Equestrian Order of the Knights and Ladies of the Holy Sepulchre and Chaplain to local chapters of the Knights of Columbus, the Columbiettes and Lions Club. Monsignor Gigantiello assisted in coordinating the arrival and departure ceremonies for our Holy Father at Kennedy Airport during the Pope’s recent visit to NYC. He was also one of the leading members of Bishop DiMarzio’s Committee that raised funds for the Italian Chapel that recently was dedicated at the National Shrine of the Immaculate Conception. Monsignor Gigantiello clearly understands that good stewardship is needed if the various ministries of the Church are to continue and that we are called as God’s people to support and strengthen these programs and institutions.